In this date in 1943, 13 U.S. Army flight nurses, 13 young enlisted medics, and 3 flight crew boarded a Douglas C‑53 trans­port in Sicily for a 90‑minute flight to Bari on the Italian main­land. As a unit of the 807th Medical Air Evacu­a­tion Squa­dron, the team’s assign­ment was to ferry wounded soldiers to hos­pitals farther from the front lines. But a winter storm and a crash landing in a remote part of enemy-occupied Albania kicked off a danger­ous 800‑mile, months­long trek to freedom for the only group of flight nurses and medics to have sur­vived so long behind enemy lines in Europe. Bravery, luck, and the heroics of the Alba­nian under­ground led to a happy ending, with 23 rescued on Janu­ary 9, 1944, and the remaining 3 on March 21. Not all nurses’ stories had a happy ending, though. Of the 54,000 women who served in the U.S. Army Nurse Corps and the 11,000 who served in the Navy Nurse Corps during World War II, a very small per­cent­age died while on active duty (201 Army nurses and 40 Navy nurses). Remark­ably, of the almost 80 military nurses cap­tured and interned by the Japa­nese in the Philip­pines, all sur­vived their three years of increas­ingly hellish treat­ment and months of near star­va­tion. (The nurses lost, on average, 30 per­cent of their body weight during intern­ment.) Affec­tionately known as the “Angels of Bataan and Correg­i­dor,” these amazing women, spread between two intern­ment camps, con­tinued to treat the sick and dying around them. In the Los Baños intern­ment camp, a multi­national POW and civilian intern­ment camp on an aban­doned college cam­pus, 11 Navy nurses func­tioned as a nursing unit until their rescue by a mixed force of U.S. Army Air­borne and Fili­pino guer­rillas on Febru­ary 23, 1945. At the Santo Tomas Intern­ment Camp, formerly the campus of the Univer­sity of Santo Tomas in Manila, 57‑year‑old Capt. Maude C. Davi­son took com­mand of the Army nurses, main­tained a regu­lar schedule of nursing duty, and in­sisted on her nurses wearing their khaki blouses and skirts while on duty. 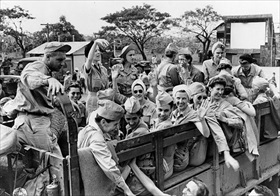 More than 3,700 civil­ian men, women, and chil­dren, including the nurses, were liberated on Febru­ary 3, 1945, by a “flying column” of the U.S. First Cavalry Divi­sion as it fought its way to Manila. Upon returning state­side, the Army awarded their nurses, among other deco­ra­tions, the Bronze Star for valor and a Presi­dential Unit Cita­tion for extraor­dinary heroism in action. The Navy nurses were likewise awarded Bronze Stars upon their return. 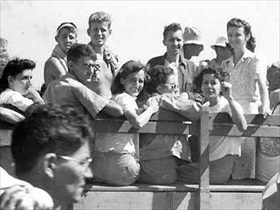 Above: Freed after three years imprisonment at the Santo Tomas Intern­ment Camp, Army nurses gathered their belongings and boarded trucks on Febru­ary 11, 1945, a little more than a week after the camp’s libera­tion, for flights back to the States. The former cap­tives were given new Army uni­forms to replace their worn-out clothes and were the recipi­ents of lip­sticks, shoes, and civil­ian clothing donated by other nurses. Santo Tomas, in addi­tion to its civil­ian internees (mostly Ameri­cans, British, Cana­dians, and Austra­lians of both sexes), was the ini­tial intern­ment camp for Navy nurses (11), Army nurses (66), and one nurse-anes­the­tist after the Japa­nese captured Manila (Janu­ary 1942) and the island fortress of Correg­i­dor (May 1942). 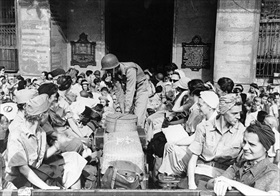 To reduce over­crowding at Santo Tomas, in May 1943 the Navy nurses left to help estab­lish a new camp at Los Baños, some 40 miles south of Manila, with an initial set of 800 male internees. Left: A truckload of some of the 2,147 Allied civilian and mili­tary internees from the Los Baños Intern­ment Camp after their Febru­ary 23, 1945, rescue, which occurred during the height of the Battle of Manila. Gen. Douglas Mac­Arthur, Supreme Com­mander for the South­west Pacific Area, had grown ever more alarmed about the plight of the thou­sands of Los Baños prisoners who, with deliv­er­ance so near, might be killed by retreating Japan­ese sol­diers. (A nurse internee learned later that the Japa­nese had planned to exe­cute every­one in the camp the very morning of their rescue.) Lasting an hour or at most two, the Los Baños Raid by a com­pany of U.S. para­troopers, 300 troops in amtracs (amphib­ious tractors), and 800 Filipino guer­rillas is con­sidered as one of the most successful rescue operations in the history of World War II. 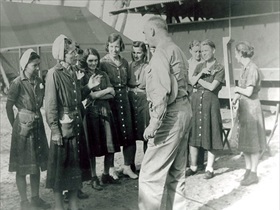 Right: Chief Nurse Laura Mae Cobb (1892–1981) and ten other Japa­nese-internee Navy nurses speak to Vice Admiral Thomas Kin­kaid after their rescue from Los Baños. The nurses were known as “the sacred eleven” by camp inmates. After returning to the U.S., Cobb was pro­moted to Lieu­tenant Com­mander and awarded the Bronze Star, a Gold Star in lieu of a second Bronze Star, the Defense of Philip­pines Ribbon, a Distin­guished Army Unit Citation, and the Asiatic-Pacific Theater Ribbon with two Battle Stars.